From Microsoft’s Audience Intelligence adCenter Labs comes this tool for Demographics Prediction which claims it "predicts a user’s age, gender, and other demographic information, based on their online behavior, such as what queries they search online and what web sites they visit"– based on MSN search which is… well…. not quite *the* web demographic. 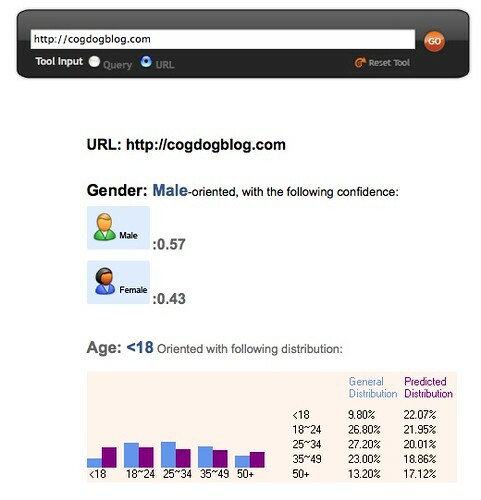 But the good news is, for people who search sith MSN, the CogDogBlog audience are males less 18. Of course it does not reveal if these represent 10,000 data points or 10. This tool uses a user’s search queries and Web page views to make demographic predictions. The General Distribution results show the age breakdown of MSN Search users, based on a one-month MSN Search log and regardless of search query used. Predicted Distribution depicts the predicted breakdown by age of MSN Search users for a single search query, based on the adLabs predictive model. Thanks for the link attribute. I’d not call it a lie, but would say it’s more of MSN specific data, and since they are not the leaders in the search industry the statistics cannot be guaranteed. But they definitely are one of the top 5 in the Search Industry and hence we can definitely gather valuable information. Not that everything that comes from there is pure junk. Please let me know if you buy my point. @Gautam Yes, my reach for a clever title may have been off kilter; my unclear insinuation is that with all statistics, there is more to consider than just the numbers and pretty charts. I’d like to see some more transparency on MSN’s part to show more where the numbers come from (a simple value for N would be a good start). Thanks for the other link…. I got the <18 demographic for my site as well, which cracks me up. There’s no way a teenager would find any interest in my site.